I did a wet brine for thanksgiving. 14# bird, spun it on the Joetisserie but the tisserie made some bad creeking noises like the bird was too heavy and it was causing strain on the motor. I decided I'd probably just stick to chickens on the Joetisserie from now on. Im not sure if a spatchcock turkey would fit on a KJ Classic. I'm going to do a dry brine on a turkey this weekend. Never done this before. Looks like you just run the brine on all over the bird and let it sit for 24 hours. Once you are about to cook the bird you wipe off some of the brine? Is that correct? Can you put a regular rub on at that point or is best to let the brine add the flavor by itself? Also, was going to cut the bird up pre cook just to help it get done a little quicker. Anyone ever done this? Thighs and legs, wings, then the breasts by itself. I've went through one bag of B&B oak Lump. Just bought a 2nd bag. It's good stuff, however takes a while to get up to temp. Anyone else used this think the same thing? 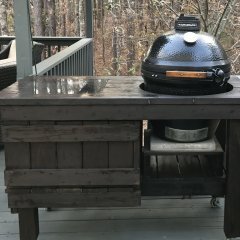 Would their hickory brand come up to temp quicker? After some research and learning about the butcher shop meat quality I went and placed an order for Choice filets from them. They have Certified Angus Beef (CAB) meat which is supposedly a better quality meat. The butcher told me there would not be much taste difference between their Prime and Choice so I went with the Choice. It was still $29.99/lb. I think I misquoted in the original post. Now, should I marinade these steaks with anything or just use sea salt and pepper? I had thought about doing an Allergo marinade which is like a Worcester sauce. Thoughts? So you think the quality is likely the same? I've got a big cook coming up with this weekend for the father-in-law's birthday. Per his request I'm going to be cooking filets. I want to buy prime steaks as this is a special occasion for him and I'm going to be buy 7-8 8oz steaks. I am am looking around locally trying to figure out where to purchase these steaks. I went to a local butcher in town that is very reputable. They sell choice for $26.99/lb and Prime for $36.99/lb. That to me was a little high. So so I decided to dive into Fresh Market (you know the chain grocery that sells lots of natural and organic). Their choice meat is $15.99/lb and Prime is $19.99/lb. Someone explain to me why the big difference in price? Am I getting a greatly infererior product if I buy from Fresh Market? Spaghetti and meatballs yet again! I made this for the 2nd time again today too! This appears to be one of Johns most popular recipes. Shuley, great post. Thanks for the information. I will definitely try freezing now if I find a good deal. Would you mind passing along that butter recipe you used for the steak? I don't like blue cheese. Would this recipe be good minus the blue cheese? Ok, so I have looked over the internet and have not found a good recipe for a filet. My Father-In-Law has requested I cook him one for his bday coming up. Lots of pressure here to come through with an outstanding piece of meat. I was going to buy a couple and do 2 different recipes as a trial and pick the best one to serve for the big occasion. He requested he have blue cheese on his. I'm not a blue cheese fan. Would it be ok to just toss some blue cheese crumbles on at the end on almost any steak seasoning or marinade? Any my ideas on recipes? I'm going to reverse sear the steaks. All help is is greatly appreciated. I have had my KJ for now about 4-5 years. I take pretty good care of it, keeping the charcoal cleaned out, the outside wiped down, etc. Last night I'm getting it ready to cook some hamburgers and after full vents open for 20+ minutes I noticed my thermometer is only reading 200 degrees and the fire is definitely getting pretty hot. I open the lid look under the top off to see about a half inch layer of grease cacked on my themometer. I grab a hot clothed and wipe most of it off and the temp comes right up. This happen to anyone else? So new method (new to me). Temp started around 500 direct. I thought about just searing it and then letting it finish on indirect but changed my mind and went direct the entire time flipping every 90 seconds. 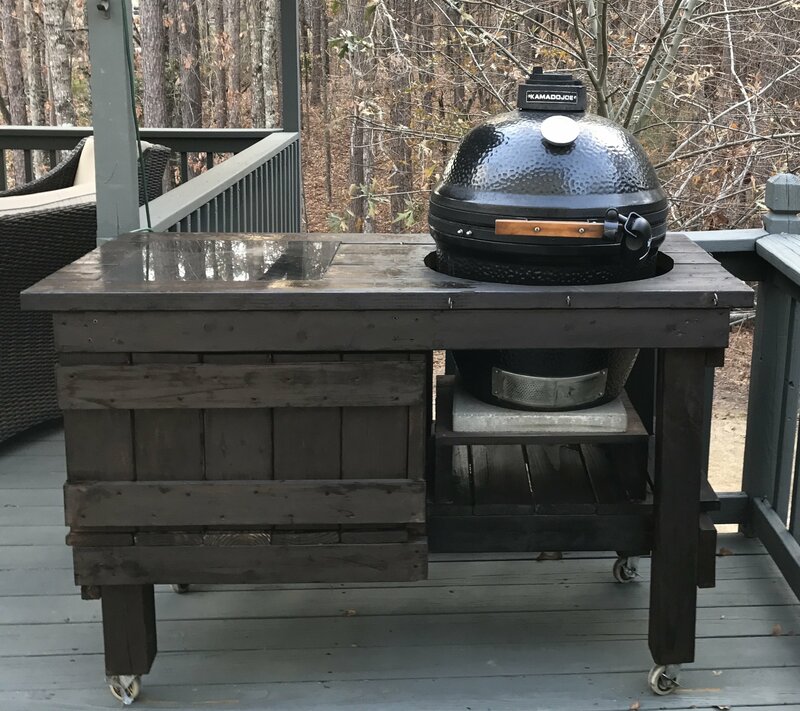 By the time it finished (about 12 minutes total time) my temp fell to 450.
what rubs are you using? Why use a coffee rub? I don't like the taste of coffee, will it give the meat a coffee flavor? I'm confused but intrigued by this coffee grind talk.